How much does it cost to travel to Minsk? How much money will you need in Minsk? Br69 ($33) is the average daily price for traveling in Minsk. The average price of food for one day is Br18 ($8.65). The average price of a hotel for a couple is Br96 ($46). Additional pricing is in the table below. These average travel prices have been collected from other travelers to help you plan your own travel budget. Minsk is the capital city of Belarus, centrally located. Situated on the Svislac and Niamiha rivers, it is also capital of the Commonwealth of Independent States (CIS), and was the capital of the former Byelorussian Soviet Socialist Republic from 1919-1991. It is a modern city dominated by monumental Stalinist architecture with many of its museums, theaters, and other cultural attractions. Following World War II much of Minsk had been destroyed, and so the city was rebuilt in the 1950s to the liking of Joseph Stalin. As a result, large, Soviet-bloc style buildings now make up a large portion of the heart of the city, making Minsk a popular draw for those interested in the Soviet Union. Other works of architecture can be admired with Saint Mary Magdeline Church (1847), which is in the Russian revivalist style, and Saint Peter & Saint Paul Church (1613), which was restored in 1871 and is the oldest church in Minsk. There are also several museums worth visiting. The National Art Museum of the Republic of Belarus is one, holding over 30,000 items of Belarusian art including works of ancient icon painting, sculpture, woodcarving, textile, paintings from the 19th century, works of decorative and applied arts, and works of arts from the 20th century. The Museum of History of the Great Patriotic War, located in Victory Park, is also popular, as is the National Museum of History and Culture of Belarus. Other well-visited attractions include Gorky Park sports and recreation facility with an ice rink and open-air theater, Minsk Botanical Garden, Minsk Zoo, Belarusian State Circus, and Park of Stones which features large rocks and stones forming a made-to-scale relief map of Belarus. As far as the main sights go, many of Minsk's museums, theaters, and other cultural attractions are located along Independence Avenue (Praspyekt Nyezalyezhnastsi), a 15-kilometer thoroughfare leading to Independence Square. Within this plaza is the massive KGB Headquarters, as well as the neo-Romanesque Church of Saints Simon and Helena, also known as Red Church. Beneath Independence Square is the "underground city," one of the biggest community and shopping centers with many stores, cafes, restaurants, and a parking area. 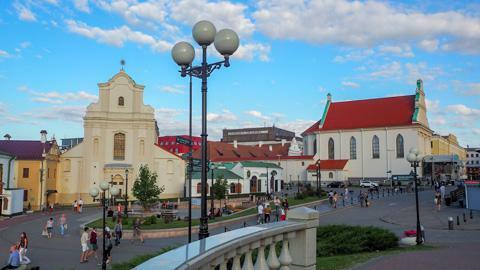 The historical center of Minsk features grandiose temples and historical landmarks. Trinity Suburb is probably the most picturesque area of the downtown center, located on the banks of the Svislac River with beautifully-colored, tile-roofed 19th century houses. These buildings hold museums, antique shops, souvenir stores, cafes, restaurants, and art galleries. Near the Trinity Suburb is Upper Town, where the second biggest thoroughfare of Minsk (Pobeditelei Avenue) begins. Along the avenue, visitors will find the Minsk Hero City architectural and sculptural complex, Great Patriotic War Museum, and Victory Park, amongst other sights. The city does not prioritize tourism and so English is rarely spoken, making it useful for visitors to learn a few Russian or Belarusian phrases before arrival. Minsk is a city of historical architecture, parks and gardens, museums, and landmarks, making it a great location for sight-seeing. As English is not generally spoken, taking a guided tour might be the best way to get the most out of a visit. Both walking and bus tours are available with audio guides in Belarusian, Russian, English, German, French, Spanish, Italian, and Chinese. The staple meals for Belarus largely consist of meat and potatoes. Potato is especially central to Belarusian cuisine and is served in many shapes and forms-incorporated into salads, served as a side, shaped into patties, baked into puddings, and much more. The most popular among the Belarusians is traditional draniki (also known as "latkes"), which are thick pancakes prepared from shredded potatoes usually served with sour cream. As far as meat goes, beef and pork are the most popular, typically served with vegetables like carrot, cabbage, black radish, or peas, and of course, potato. Salted pork fat is also common. Beyond meat and potatoes, Belarusians do eat some fish, preferring dishes like yushka (fish-based soup), galki (fish-balls in broth), and also baked or boiled river-fish. Onions, garlic, parsley, dill, caraway seeds, and pepper are the main seasonings and are used moderately in cooking. Mushrooms (dried, salted, or pickled) are also well-used, as are berries like bilberry, wild strawberries, red whortleberry, raspberries, and cranberries. As of February 12, 2017, citizens of 80 countries and territories (including European Union member states, the United States, and others) are allowed to visit Belarus visa-free for up to 5 days, applicable to visitors entering and leaving through the border checkpoint at Minsk National Airport, the main way of entry. The airport is located about 37 kilometers northeast of the city. Service to and from the airport is available by bus or train. Public transit is very good in Minsk itself, making it easy to navigate the city by bus, trolley, tram, or metro. Car rentals are also available.